Anakin Vet update, It turns out that the Wellness canned cat food that Anakin has eaten his entire life went under a formula change. I didn't know this at the time & thought they had just updated their logo and labels. So I think all of Anakin's problems recently have been because of this food formula change. Looking at the Wellness Facebook page it looks like lots of other people are having problems with their pets adjusting to this new formula too. Wellness says that they made minor changes to the food formula. However I think these changes are way more significant than they realize. 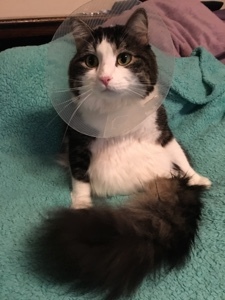 So Ani is wearing the cone again and I am taking good care of him. He has pretty bad diarrhea right now and is not feeling very well. Today I bought Royal Canin gastrointestinal high energy food to try & switch him to. Hopefully he will like it and it will be something I can feed him long-term. I'm taking Ani to the vet in the morning. They are going to put him under anesthesia to completely shave his belly and part of his tail, clean him up really good, check out everything down there, and check him over real good, eyes, ears, teeth, etc. while he's under. I have put up a sale on my fantasy cat art website to help cover these vet bills. Everything at Tigerpixie.com is 20% off until July 9, 2017. Thank you so much for looking. I will keep you all updated on how he's doing. Hi Carrie,So just to add to your comment regarding Wellness...I think they had 8 or 9 different flavors and my cats ate all but 1 flavor and I think it was the Lobster...But anyway they stopped eating just about every flavor and it seemed like it happened within a week or two after what I deemed months and months ago was a change in their food formula...They told me the same when I called them...Saying it was a minor change but I'm with you...I believe it's way more significant than they're saying...Which is a shame because they loved it...Well I hope Ani feels better and takes to his new food. Aw, poor Anakin! I hope the new food works out for him! Do you have a paypal for donations? Thank you so much! <3 Yes it's chawks@tigerpixie.com I am having a sale to raise the money by selling my artwork on Tigerpixie.com I'd love for you to have a look and see if there's something there you'd like instead :) xoxo! I stopped feeding Wellness a while ago because of the carrageenan. I found Wild Calling and they love the chicken and turkey flavors. So hard to find food that is ok. Even the high end stuff is not always good for them. I hope you can find something for poor Anakin. Poor Ani. I am sending lots of healing purrs his way. We do not eat wellness but see another national brand has changed and our Rumpy now has loose poops again. Why fix when its not broken?